Otis McAllister’s Travel Retail division has become a regional confectionery powerhouse, as it now represents five out of the top six global suppliers of confectionery in travel retail. 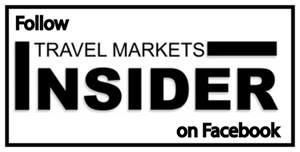 TMI met with Otis McAllister’s Travel Retail Sales Directors Justin Nee and Marc Panara in their Fort Lauderdale office to talk about their division’s explosive growth. The company today distributes confectionery from Mondelez, Mars, Lindt, Ferrero, Ghirardelli, Perfetti Van Melle, Haribo, and Hershey, among others. “What we’re most proud of as a division is that since 2012 through 2018 we’ve had a 39% annual compounded growth rate. The division has really blossomed,” says Panara. In 2012 Otis McAllister merged with travel retail distributor American Caribbean Gateways led by Nick Tamma and formed a new travel retail division focused on confectionery and tobacco. “When I first came onboard Nick Tamma was mainly in tobacco and cigarettes and we were transitioning into confectionery. My first week was when we brought in Ghirardelli. Gradually, slowly but surely, we have grown,” says Nee. 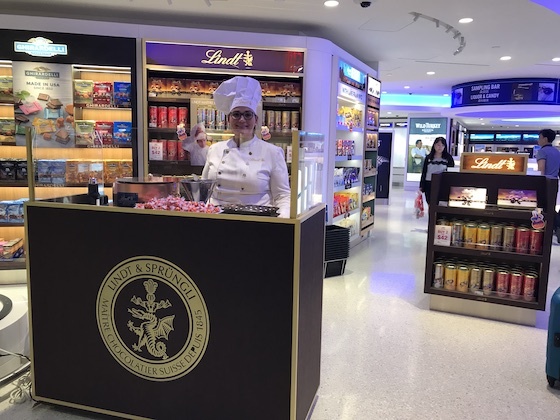 Otis McAllister and Lindt & Sprüngli Travel Retail celebrated the opening of International Shoppes’ new store at JFK Terminal 1 in November by treating passengers to Lindor Truffles freshly prepared by Lindt Master Chocolatiers. The 11-day event, the first of its kind in North American travel retail, was the result of the strategic partnership between Lindt & Sprüngli Travel Retail, IS and Otis McAllister. During the campaign, sales through the IS store saw double-digit growth, with sales of ‘theme items’ such as Lindor up by nearly 80% compared to a normal trading day. In 2016, Otis McAllister began working with Mars and Mondelez. This March the company added Hershey’s and Hawaiian Host to its confectionery portfolio, after Chase International decided to focus on its spirits business. Nee says with its expanded confectionery portfolio the company now has the critical mass necessary to grow the business even more. 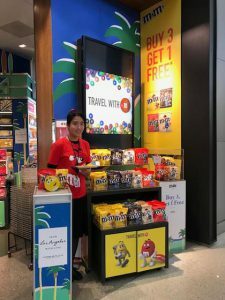 M&M’s at LAX TBIT with DFS. Both Nee and Panara tell TMI that it is the strong team the company has assembled –now numbering ten — that sets them apart from its competitors. “We’ve really built an amazing travel retail team. Marc and I grew up together since we were in fourth grade. We are best friends and work off each other’s strengths. And the entire team works well together,” says Nee. Otis McAllister sees huge opportunity with its confectionery brands onboard the cruise ships. Although cruise is currently a small part of the company’s business, they expect sales to steadily grow in the channel, says Nee. “We see cruise ships as a great avenue for growth within our category. The cruise line numbers continue to soar. We see it as a growth opportunity,” says Nee. Otis McAllister is supplying product to Harding Brothers and Starboard. Tobacco still plays a crucial role for Otis McAllister’s travel retail business. “On the tobacco side we are representing the U.S.’ number one premium made cigar company General Cigars, which makes Cohiba, Macanudo, and Partagas for the U.S. We are also representing Scandinavian Tobacco Group, which has Café Crème, a machine made cigarillo,” says Panara. 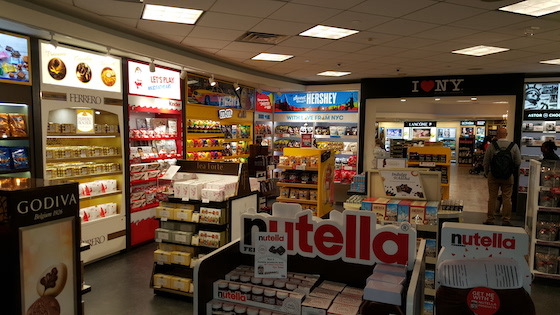 While Nee says Otis McAllister’s U.S. airport confectionery business is its “bread and butter,” he sees room for expansion into new markets and even new categories. “Confectionery is our core. We are committed to the confectionery category. We want to build off of our strength in the U.S. We see great opportunity for growth in South America, and in Asia as well,” says Nee. “Ideally long term in ten years how do we grow the business? We’d love to have a similar operation in Latin America, maybe one in Asia, and going into Canada is an obvious step. Mimicking what we do here in those parts of the world, respectfully understanding that Mondelez and Mars and Lindt have distribution setups in Asia,” says Panara. After new markets, the company might launch a new spirits division. “We’ve talked internally about what is the next step for us. Obviously we don’t want to take our eye off the prize. We know we have a strong dynamic here in the confectionery world, but really for us to take it to the level, we need to move into another category. We are not saying we are doing it today, but naturally we have talked about a liquor division because the liquor and tobacco buyer are mostly the same,” he continues. But before it expands to another category Otis McAllister is firmly committed to what has brought them to this point. The company just added Ritter Sport and Welch’s fruit snacks to its confectionery portfolio. “We’re never happy with the status quo. We are committed to category growth,” says Nee.